Conygree Farm is a 75ha (180 acre) mixed farm in the heart of the Cotswolds. Conygree is part of the National Trust’s Sherborne Park Estate (the home of BBC Springwatch 2017) and the historic landscape of Lodge Park. Our flower rich meadows, grass margins, dry stone walls, hedges and fields of wild bird seed, fallow and nectar rich clover are a haven for wildlife, particularly farmland birds such as corn bunting, lapwing and skylark. We keep rare breed Cotswold sheep and Traditional Hereford cattle, and native breed pigs. We produce delicious and award winning lamb, hogget, mutton, beef and pork to the highest environmental and animal welfare standards. Our free range cattle and sheep are reared on a natural organic diet of grass, wildflowers and herbs all year round. We turn sunlight into Sunday dinner - nothing added. No artificial fertilisers, sprays, grains or imported soya are used. Our organic ‘pasture for life’ or ‘grass fed’ approach is better for the planet, our livestock and the consumer. 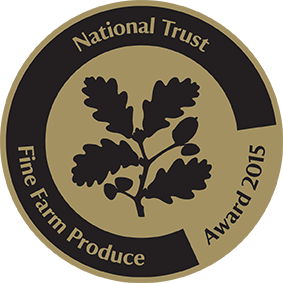 We are assured by and work closely with Organic Farmers & Growers and the Pasture Fed Livestock Association. We also run a small and friendly DIY livery for 5 horse, and host educational visits and bespoke events. We sell most of our lamb, pork and beef direct to the consumer from the farm gate. Most people buy a box e.g. half a lamb, although you can buy individual joints too. We aim to reduce food miles and help reconnect people with the land, traditional breeds, food provenance and seasonality. Consumers who are prepared to pay that little bit extra for quality food with high environmental credentials are not only getting a premium product, but are also helping to support our conservation work and the survival of our local breeds. Our meat is ideal for those on a grass fed, Paleo or clean diet, and those that seek real taste and good value. See our Lamb, Beef and Pork pages for more information or click How to Order. Content © Conygree Farm. Privacy and Cookies Policy. Website management by Pippin Consultancy Ltd.